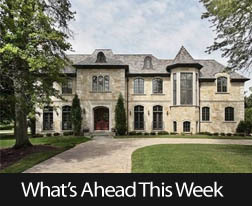 Last week’s scheduled economic reports included the Case-Shiller 20 and 20-City Index reports, pending home sales data released by the National Association of Realtors® and the scheduled post-meeting statement of the Federal Reserve’s Federal Open Market Committee. The Case-Shiller 20-City Home Price index for May reported that year-over-year home prices grew by 4.40 percent year-over-year. S & P Index Committee Chair David M Blitzer said that home prices are increasing gradually by four to five percent a year as compared to double-digit percentages seen in 2013. Mr. Blitzer said that home price growth is expected to slow in the next couple of years as home prices have been growing at approximately twice the rate of wage growth and inflation, a situation that is not seen as sustainable. Denver, Colorado led the cities included in the 20-City Index with a 10 percent year-over-year growth rate for home prices. San Francisco, California followed closely with a year-over-year gain of 9.70 percent and Dallas Texas posted a year-over-year gain of 8.40 percent. Fastest month-to-month home price growth in May was tied by Boston, Massachusetts, Cleveland, Ohio and Las Vegas, Nevada with each posting a monthly gain of 1.50 percent. May home prices remain about 13 percent below a 2006 housing bubble peak. According to the National Association of Realtors®, pending home sales dropped by 1.80 percent in June as compared to May’s reading. The index reading for June home sales was 110.3 as compared to May’s index reading of 112.3. This indicates that upcoming closings could slow; June’s reading represented the first decrease in pending home sales in six months. Lawrence Yun, chief economist for the National Association of Realtors®, cited would-be buyers’ decisions about whether to hold out for more homes available or to buy sooner than later will affect future readings for pending home sales. The Fed’s FOMC statement at the conclusion of its meeting on Wednesday clearly indicated that Fed policymakers remain concerned about economic conditions and are not prepared to raise the federal funds rate yet. The FOMC statement did not provide any prospective dates for raising the target federal funds rate, which is currently at 0.00 to 0.25 percent, but the Fed continues to watch employment figures and the inflation rate. Freddie Mac reported that mortgage rates fell last week, likely on news of the Fed’s decision not to raise rates. Average mortgage rates fell across the board with the rate for a 30-year fixed rate mortgage dropping by six basis points to 3.98 percent; the rate for a 15-year fixed rate mortgage dropped by four basis points to 3.17 percent and the average rate for a 5/1 adjustable rate mortgage fell by two basis points to 2.95 percent. Average discount points remained the same for fixed rate mortgages at 0.60 percent and fell from 0.50 percent to 0.40 percent for 5/1 adjustable rate mortgages. This week’s economic calendar includes reports on consumer spending, core inflation and consumer spending. July readings on Non-Farm Payrolls and the national unemployment rate will also be released along with regularly scheduled weekly reports on new jobless claims and mortgage rates.